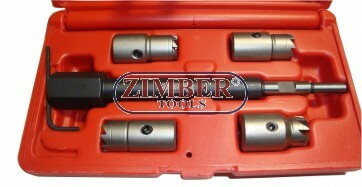 5-piece Injector Sealing Cutter Set for CDI Engines - ZIMBER TOOLS. 19 mm offset reamer fits for Fiat / Iveco. Grinder for 15 mm Injector Nozzle Face Cleaner, Mercedes-Benz CDI. 15-mm-62606 - BGS technic. Diesel injector seat cutter set 8pcs ZR-36DISCS08 - ZIMBER-TOOLS. Diesel Injector Nozzle Cleaner 1pc. FIAT / IVECO. FORD. 17x17mm - ZIMBER.